What is a Live Qualifier auction? A Live Qualifier auction event is one where the seller will be actively “Live Qualifying” bids during the closing of the auction. This means that you will have a fully engaged, highly motivated seller reviewing your bids in real-time as they are made on the website. Sellers will have the ability to lower reserves even further during the auction event and will also have the ability to make decisions on the spot. All properties are priced below market value and all will be sold subject to a reserve. How often are Live Qualifier auctions conducted? These events will become more frequent in the coming months. Make sure to check our auction schedule frequently because we will be scheduling these events regularly. What type of properties are being auctioned? Nationwide residential properties that may either be Occupied or Vacant are going to be auctioned in these events. When is your next Live Qualifier auction? We hold Live Qualifier auctions a few times a month. Check our Auction Calendar for the next event! Registration is done on the property details page. 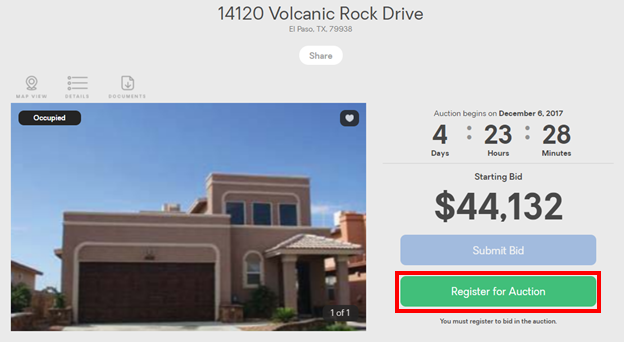 You’ll want to click on the green button labeled “Register for Auction” which is located directly below the starting bid amount. Registration is quick and easy with no bid deposit required to participate. Will there be a Starting Bid? Yes, all properties will show a Starting Bid on the property details page. The properties scheduled for this event may be either Occupied or Vacant. However, the majority of the properties are Vacant. It is important that you do your due diligence prior to bidding on a property. Researching a property by visiting it if possible, and checking county records before bidding allows you to make an educated decision when it comes to bidding and will allow you to bid with confidence. What is the seller willing to take for these properties? All the properties scheduled for this event are being priced below market value and the Seller is very motivated to close before year end. Vacant properties will have a property inspection report with the latest inspection details. Property inspection reports will be posted on the website on the Property Details Page. It is important that you do your due diligence prior to bidding on a property. Researching a property by visiting it if possible, and checking county records before bidding allows you to make an educated decision when it comes to bidding and will allow you to bid with confidence. Title Information will be available on all of the properties scheduled for this event. These reports will be posted on the website on the Property Details Page. Buyers are always encouraged to conduct their own title due diligence prior to placing bids. Will I or my Agent be able to view the inside of the property prior to placing a bid? If the property that you’re interested in bidding on is Vacant and has a lock box available your Agent will be able to access the interior prior to bidding. If you are a licensed real estate agent that would like to view a Vacant property, please contact the Auction team for lock box codes at 800-441-9401. Are there commercial properties being auctioned in this event? Not this time. There are no commercial properties included in this auction. Are there Listing Agents assigned to these properties for showings or questions? Depending on the product type, listing agents may or may not be assigned to a property.